Many times the office printer would hold a 30″ Roll of Papers made for American Printing but the roll did not fit in the holder. Now that has been solved. If your printer uses ink then the roll is 300-feet long for biggest. 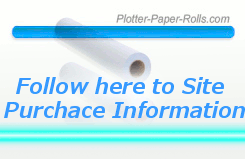 If you use Toner for your printing it is 500-feet – see our online site we have both.